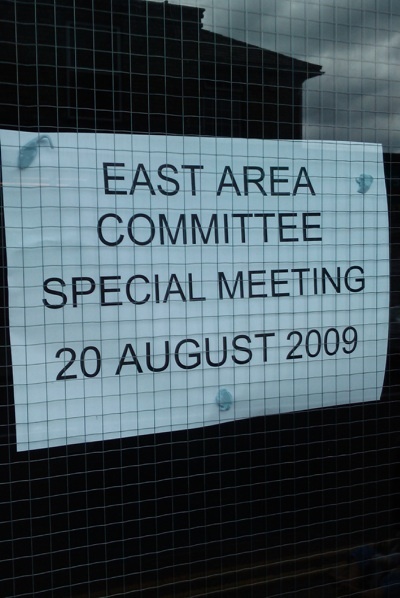 On the 20th of August 2009 I attended a special Cambridge City Council East Area committee meeting which had been called to decide the council’s response to statements by Tesco indicating their intent to ignore planning conditions relating to their Mill Road store. The conditions state that deliveries of goods have to be made from within the site ie. using the service yard at the back, rather than from Mill Road. A letter from Tesco was read out by the meeting’s chair, Cllr Blencowe, this put forward the company’s opinion that the conditions would not be enforceable due to the fact that since the time they were imposed a one way system, bollards, and other measures have been introduced to the neighboring streets. Council officers’ contrary view that the condition is enforceable was also reported to the meeting – via Martin Lucas-Smith quoting an email which has been published on Cllr Chris Howell’s website. The letter from Tesco (which was not made available to the public at the meeting) also stated that “Tesco intends to deliver from within the curtilage of the site”. It was reported that those members of the council who had called for the meeting still wanted it to go-ahead despite the letter being received. After having heard from members of the public, and councillors acting as representatives of their constituents, remaining councillors who had not “fettered their discretion” by expressing views on matter went into private session. Before entering private session the meeting’s chair explained that councillors would receive legal advice in secret, and then return to the public session to continue their deliberations, and explain what had been discussed in private. The council’s senior legal officer addressed the meeting to explain the importance of legal advice remaining confidential and pointing out that when the council is contemplating legal action it would be counterproductive to make the council’s opponents in that action aware of any weaknesses in their argument. It was reported that those councillors who were making the decision were unanimous in their approval of it. It appears to me that the decision means councillors did not accept the letter of the 17th of August as a “satisfactory undertaking” yet on the basis of that letter they decided to take no immediate enforcement action. Most members of the public looked confused and bemused when the decision was read out. The No Mill Road Tesco campaign stated its intention to take the council to the high court if it failed to act to enforce the planning conditions. Cllr Blencowe questioned if all members of the No Mill Road Tesco campaign were aware of, and supported the campaigns actions (which he pointed out were being carried out via an individual member of the campaign, supported by legal aid). Cllr Blencowe pointed out there would be significant costs to the public purse as a result of the council defending any action against it. A suggestion that Tesco had breached planning consents further, by installing a plant room in the first floor office space was raised. Cllr Blencowe ruled that discussion of that point could not take place at the meeting, though the council’s head of planning confirmed that the usual process would be undertaken to investigate the claim. Members of the public, and councillors, urged those making the decision not to give too much weight to an informal assurance from Tesco, pointing to many occasions where it was claimed Tesco had broken such assurances. A number of people asked for a professional opinion from the council’s legal and planning officers as to if deliveries to the site during the fitting out of the shop were contrary to the planning conditions. No councillors spoke up to agree this was an important question, and therefore it was not put to officers. Representatives from Tesco were present, but did not seek to address the meeting. The Conservative’s Prospective Parliamentary candidate, Richard Normington, came into Cambridge to observe the meeting. I estimate around a hundred members of the public attended the meeting which was held in St. Phillips Church on Mill Road, a few doors down from the proposed site of the Tesco Store. The council sent their head of legal, Simon Pugh, and director of environment and planning, Simon Payne, in my experience it is unprecedented for such senior officers to attend an area committee meeting. The leader of the council, Ian Nimmo-Smith was present in one of the public pews. The meeting started late as councillors were receiving a “special procedural briefing” in the church’s play room. Apologies for absence were received from Cllrs Hart and Benstead who were at work and had not been given enough notice of the meeting to arrange time off. Cllr Herbert’s apologies were given, with his collegues explaining he was on holiday. It appeared to me that councillors only added Cllr Lynn to the list of those whose apologies were being given once they realised she wasn’t present. Councillors were then asked to declare any interests. Romsey City Councillor Sarah Ellis-Miller said she was a resident of Sedgwick Street and Cllr Shah said he had some shares in Tesco, but that they were “within the limits”. Both councillors decided that their interests were non-prejudicial and ought not exclude them from the decision making process (that judgement is down to the individual councillor). Cllr Blencowe the meeting’s chair opened proceedings explaining the meeting had been called following public concern about the planning conditions relating to delivery arrangements for the Tesco store on Mill Road. He explained there had been a lot of correspondence with ward members, and consideration had been given to the question of if the council’s planning department could have dealt with the situation themselves. Cllr Blencowe reported planning officers were “prepared to consult the chair of the East Area Committee” on what they were doing (I think the councillors ought be directing the officers). Cllr Blencowe reported that he had met the planning officer responsible for the application, Peter Carter, on the 6th of August and they had discussed if the issue of enforcement ought be referred to the council’s central planning committee, but had decided that as the East Area Committee had dealt with the application up to this point it ought continue to do so, as it was a clearly local matter. Do they intend to service the store from Mill Road? If not, how do they intend to service the store? What will the frequency of deliveries be? What size of vehicles will be used? Tesco’s response was reported to be of the opinion that as the planning condition was from the 1970s, before the one way system and other traffic control measurers were in-place enforcement of the condition would not now be reasonable. The letter also stated Tesco’s “intent” to “deliver from within the curtilage”. A proposed frequency of deliveries of three a day plus newspapers was reported to have been in the letter, and all deliveries Tesco said were to take 40 minutes maximum. Tesco’s letter also said that in light of the Planning Inspector’s comments that a 10.5m long vehicle would be unsuitable for servicing via the Catherine Street / Sedgwick Street “loop”, they would use 8m long vehicles. The four members who had been calling for the meeting had been made aware of the content of Tesco’s letter, Cllr Blencowe reported that none had dropped their request for the meeting in light of it. Extracts from an email from Cllr Benstead, complaining about the way the meeting had been organised and resourced were read out. He did not believe that council business was being properly conducted, and thought the notice of the meeting had been sent out too late. He said councillors were entitled to due consultation from proper briefings by the council’s professionals. He said public notice, as well as notice to councillors was less than ideal. Cllr Benstead pointed out he works a 9-5 week so needs notice of committees. Cllr Blencowe then explained to the public that the councillors were split into two groups – those who would be acting as advocates for their constituents, and those who would be making a recommendation / decision (he corrected himself to “decision”) later. He invited councillors who wanted to make statements about their position to do so. Cllr Howell said that as this was an enforcement matter he thought the position might be slightly different to planning, but that he had asked council officers for a legal briefing to explain but he had not been provided with one. He said he did not think that by expressing an opinion he had “fettered his discretion”. [Cllr Howell did not join those councillors who finally debated the decision in secret, he told me he had been told he was not able to join them]. Cllr Howell also told the meeting that as one of those councillors who had called for it, he had not intended it to be quite so narrow. Cllr Bradnack spoke briefly to say he would be representing residents therefore not taking part in the decision. As I have written before I think this charade is ridicuous, I think planning is a democratic and not a judicial matter – clearly it is as people who don’t like their councillor’s decisions can vote them out. I think that excluding councillors from decision making disenfranchises their constituents. Simon Sedgwick-Jell the County Councillor for Abbey spoke from the public pews, rather than the councillor’s platform to briefly say that highways safety was a matter for the county council. [Clearly he's right to a degree, but planning applications and planning conditions also impact on highways matters, and the one under discussion clearly did so I wasn't sure what point he was making]. There was an interesting clarification of the role of county councillors in making planning decisions on area committees; the chair made clear they can participate in the discussion, but not vote. (This is substantially more than a member of the public can do, as they can only make a three minute speech, and perhaps, if the chair is feeling generous correct any factual errors made by councillors). Lulu Agate spoke on behalf of Cambridge Friends of the Earth. She told councillors: “You made good decisions, the planning inspector agreed, I’m asking you to enforce your decision”. She said that she and other residents would abide by decisions of councillors, if they apply for and don’t get planning permission then they don’t go-ahead regardless, she said Tesco ought also respect the planning system. Cllr Blencowe pointed out that the planning condition of relevance to the decision to be made dated from the 1970s and not to the more recent planning decisions made by the East Area Committee. Lulu Agate had asked to speak first because she had to leave the meeting early. Ruth Deyermond spoke on behalf of the No Mill Road Tesco campaign, and said she was a resident of Argyl Street, living within 150m of the proposed store. She started by drawing councillor’s attention to the fact there is more than one planning enforcement issue which needs to be considered, and urged the council to use their teeth. The first issue she said needed addressing was the no loading and unloading except within the curtilage of the site. She then took the opportunity to give the meeting an update as to what the campaign were doing, saying that it was relevant to the matter under discussion. She told councillors that the subject under discussion was increasingly likely to appear in court, letting councillors know that one of the No Mill Road Tesco campaign members is in the process of serving the city council with notice of judicial review of their failure to enforce the planning condition when in possession of a clear statement of intent to breach the condition. Ruth Deyermond said that if Tesco didn’t sign a letter saying which would bind them to not delivering from outside the curtilage of the site or councillors decide not to take action then the matter would be taken to the High Court. Turning to the second planning enforcement issue, Ruth Deyermond said that she had been reliably informed that Tesco had converted part of the first floor office space in to a plant room, without the required planning permission. Cllr Blencowe intervened to prevent this point being pursued on the grounds that it was not related to “the text of this meeting”. Ruth Deyermond, supported by members of the public heckling, disagreed, saying that the notice of the meeting they had said that issues of planning enforcement were to be discussed, and that this was an issue of planning enforcement. Cllr Blencowe continued, responding to update on the preparations for court proceedings, said that while individuals were entitled to make use of the judicial review procedure he thought that it needed to be pointed out that the legal action was being taken on the behalf of a local resident under legal aid. Cllr Blencowe explained that when groups serve legal notices on the city council that invokes a response from the council, and in this case will incur considerable costs to the public purse. Cllr Blencowe then made the highly controversial comment : “Do all members of the No Mill Road Tesco campaign support what is being done in their name?”. The group’s decision making and processes for keeping members informed were defended from the floor by a number those present. Members of the public (presumably members of the campaign) said that the decision to seek judicial review had been made as a group. Attempting to restore order Cllr Blencowe stated that only those who had given their names to council staff on the door and asked to speak would be allowed to contribute. This prompted one man to get up and complain he had not been asked if he wanted to speak (I hadn’t been asked either, and when I attended my first area committee meeting I left feeling very disenfranchised as I’d not been made aware I had to register to speak and it was one where the chair only took questions from speakers who had asked in advance). The man who made a fuss was in fact allowed to speak but others were not. I can see that it might have been very time consuming to give an opportunity to speak to all those present, but perhaps by insisting that only new points be raised, and limiting the time even further – say to just a minute after the first 10 or so speakers a much more inclusive meeting could have been run, and councillors would have benefited from a wider range of opinion and ideas. Shortly after the matter of the alleged breach of planning law with respect to a first floor plant room was raised the leader of the council, Ian Nimmo-Smith, left his pew to speak to the council officers on the altar. I asked him after the meeting what he had been saying; he let me know he’d asked officers to explain what they would do now they had been made aware of this. Sure enough, later in the meeting the director of environment and planning reported that the council’s due processes would be initiated following the report of the alleged transgression. When he did this members of the public suggested a five minute adjournment for an impromptu immediate site meeting but this request was rejected. Katie Preston addressed the meeting to say that the number of people attending the meeting in itself, especially given the short notice and timing of the meeting said more than words about the strength of people’s feelings. She defended the internal decision making of the No Mill Road Campaign too, saying they had made clear their intentions on their website and there had been lots of email discussion. She said that very clear direction from the membership over how the campaign ought continue, and the fact it ought continue, had been received. She criticised Cllr Blencowe for the way he had cut Ruth Deyermond off. Cllr Blencowe explained he had stopped Ruth Deyermond from speaking as she had raised a subject which he thought might become the subject of a future planning application. Sheila Jeffery, a Sedgwick Street resident said that there had been major breaches of planning restrictions, which as well as a breach of planning were causing a safety hazard. She said that it was only down to luck, and perhaps lower traffic levels due to it being a holiday period that there had been no serious accidents. Turning to Tesco using the Sedgwick Street / Catherine loop for deliveries, she said this would be inappropriate for regular deliveries. She asked what would happen when there was more than one lorry present, and said she expected one to end up parked on Sedgwick Street. She encouraged councillors to use their powers to do what they can. Len Freeman said that the short notice for the meeting had been unsatisfactory, and complained the meeting was going into secret session so that the public would not be able to see what was decided. Mr Freeman said the council had a duty to enforce planning conditions. With respect to large vehicles using the Sedgwick Street / Catherine loop he said there would be only inches to spare between lorries and parked cars. He noted the widths of the lorries had not been mentioned, only the lengths. He told councillors about a fight which had broken out when a lorry had broken a wing mirror of a car the day before. He finished by urging councillors to treat Tesco’s word with extreme caution, pointing to previous instances were he felt they had broken their word. Martin Lucas-Smith spoke on behalf of the Cambridge Cycling Campaign; he informed councillors that the cycling campaign was a local voluntary group with over 1,000 paid up members. He explained that the campaign was commenting solely from the perspectives of traffic, safety and the enforcement of planning decisions. He pointed to the fact that Tesco had clearly stated their intention to breach the planning condition requiring them to deliver from within the service yard both in papers presented to the meeting which considered their alcohol license and in an email. Given that the intent to breach the planning condition was clear, he suggested the next question was if the planning condition was enforceable. He pointed to an email from the planning department, published on Cllr Howell’s website, which had indicated it was the council’s opinion that it was enforceable. Referring to the letter read out by Cllr Blencowe at the beginning of the meeting Mr Lucas-Smith drew councillors’ attention to the fact it was loosely worded, merely stating their “intention”. He said that it made a mockery of the planning process if conditions were not enforced. He also reminded councillors about county council proposals to spend £400,000 on safety improvements on Mill Road, efforts which he said would be undermined if the city council were going to allow Tesco to create a new hazard on the road. Mr Lucas-Smith asked if an opinion could be obtained from officers on if deliveries to the store for the purpose of fitting out would count as deliveries in terms of the planning condition, saying that if Tesco are in breech now, then action ought be taken now. No councillors took up Mr Lucas-Smith’s suggestion and the question was not put to officers. Mr Marks addressed the committee briefly to say that if various councillors were not in a position take part in decision making because they’d made their views known in advance then given his earlier remarks about the No Mill Road Tesco campaign the meeting’s chair, Cllr Blencowe certainly wasn’t. Cllr Harrison pushed to speak before she was invited to by the chair. She asked for an explanation to be made of why the rest of the meeting was to be held in private. She also praised Ruth Deyermond for the outstanding job she had done co-ordinating the No Mill Road Tesco campaign and urged her fellow councillors to listen more to what people were saying to them. Mr Pugh told the meeting that council business was conducted in public and only with good reason were the press and public excluded. He said members were entitled to receive advice including on the strengths and weaknesses of the council’s case, but that it wasn’t appropriate to show the council’s hand in advance of potential legal action. He said there was a need to preserve the confidentially and “privilege” relating to legal advice. Cllr Howell, who had been sitting in the public pews took up a position in front of the Altar to address his fellow councilors. He said that there had been a huge number of questions unanswered in relation to this planning enforcement issue. He said the various options which the council could take had not been made clear. Cllr Howell clearly expressed his opinion that: “In this case the council ought enforce”. He went on to explain why; starting with the “Blatancy” of the breach by Tesco who he reported had gone to the press saying that they can just ignore the planning constraints. He said he was concerned that Tesco would get away with such behavior just because they are a big company. While a number of members of the public had received applause after their statements Cllr Howell was repeatedly interrupted with supportive applause. Cllr Howell’s second reason for urging the council to enforce was safety. He said that wherever possible deliveries ought not be made from Mill Road, and councillors should not let the road become more dangerous. His third reason was the level of local concern. He suggested, as others had done, that those councillors making the decision ought treat Tesco’s statements with skepticism and “a pinch of salt”, until they had a legally enforceable commitment which they could enforce in their hands. Cllr Howell was urging pre-emptive action, ie. an injunction, but failing that he proposed authorising officers to take action as soon as a breach occurred after the store was opened. After the meeting, when I sought the full text of the decision made I discovered that that latter point was in-fact recommended to councillors by officers and was included in the confidential report made to councillors. All councillors actually did was approve their officer’s recommendation a minor amendment to the text. Cllr Howell continued asking those councillors making the decision not to make a decision which would allow Tesco to carry on trading in breach of the planning rules. Cllr Bradnack started by saying he supported much of what Cllr Howell had said. He said he too had difficulties in trusting Tesco’s undertaking. He said he felt Tesco had been, and still were, trying to test and see what they could get away with. Turing to Tesco’s letter saying they would use 8m vehicles, Cllr Bradnack said he thought that 8m vehicles would have difficulty negotiating the Sedgwick Street / Catherine loop; he said he didn’t think an 8m vehicle could get round, and that access to the store via the loop would be unacceptable. He said that councillors ought support the planning inspector’s recommendation that such access would not be acceptable, and that Tesco too ought have taken more notice of that. Labour County Councillor for Coleridge and Labour prospective parliament candidate for South Cambridgeshire, Tariq Sadiq addressed councillors briefly saying that Tesco had pushed ahead despite problems such as delivery via the loop being “impossible”. Cllr Killian Burke, County Councillor for Romsey, started by saying that Tesco’s statement that they were willing to deliver via the loop was not binding, so there was a need to take a pre-emptive approach, and to also consider what measures to take if Tesco breach the conditions once they are open. Cllr Burke asked officers for a conclusive definition of what counts as “goods”, asking, as Martin Lucas-Smith had, if the deliveries to the site to-date counted. He said there were already photographs which could be used as evidence of breaches already if the deliveries in advance of opening counted. Simon Sedgwick-Jell the County Councillor for Abbey addressed the meeting, starting by critising the “overly robust and near partisan chairing of the meeting at the beginning”. He said that the condition which had been imposed in 1971 had always been recognised, and pointed out that the traffic situation on Mill Road had not improved since it councillors set the condition. He suggested that councillors ought give delegated powers to officers so that they could deal with breaches promptly. Responding to Cllr Blencowe’s comments, Cllr Sedgwick-Jell said that he didn’t think council tax payers would think that it was wrong to spend their money ensuring that big companies play by the same rules as the rest of us, rather than the council rolling over with its legs in the air. Cllr Sedgwick-Jell described delivery via the Sedgwick Street / Catherine loop as “impractical”. Cllr Blencowe made clear that his earlier comments had referred to the costs of the council responding to the threat of, or an actual, judicial review brought by the member of the NoMillRoadTesco campaign. Mr Payne, the council’s head of environment and planning addressed the meeting. He said: “The approach the city council takes on enforcement is serious, methodical and robust”. The council, he said, does not rush, but takes a proper and robust approach after officers have collected all the facts and evidence. With respect to the change of use of the upper floor, he assured the meeting that the council “will investigate with proper process” and said it was “not an issue for today”. Mr Payne said that as well as the No Mill Road Tesco Campaign being busy burning the midnight oil, his team had been too, and officers were working exceptionally hard; and a huge amount of work had gone on, and continued to go on. The meeting was adjourned at 11:30; just as the adjournment was being called Martin Lucas-Smith asked the chair if the representatives of Tesco present ought be given the opportunity to speak. Cllr Blencowe ruled that as they were not on the list, and had not indicated they wanted to speak they would not (the representatives did not appear to be wishing to speak). Cllr Blencowe said the meeting would reconvene in public at midday, he gave the impression, and the council’s head of legal appeared to concur – that the councillors would only receive legal advice in private then return to the public session. The committee eventually re-convened, with many members of the public still present, at 12.50 PM, all that occurred then was Cllr Blencowe reading out the decision notice which I have reproduced above. Speaking to the council leader, Ian-Nimmo-Smith, after the meeting I asked if the secret report contained a quantification of the risk to the council of acting vs not acting to enforce the planning conditions. He told me those kind of calculations had not been made and were not in the report, he said the council has not made estimations of such things as the amount of lost profits the council could be liable for if the store sued the council, or how much defending the judicial review action might cost. As usual any corrections or additions will be gratefully received; either via the comments or directly to me as appropriate. This entry was tagged Mill Road, Planning, Tesco on August 20, 2009 by Richard Taylor. Thank you to Richard for this report, which looks to be an accurate record of what happened. I am a resident of Sedgwick Street. I attended the first part of the meeting and wished to speak about the planning issues, but I was denied the opportunity. Apparently I should have registered my intention upon arrival, but nobody asked me at the door so I didn’t do this. The argument used time and time again by most speakers was that the Council would always take action against ordinary residents for breaching planning rules, but they seem to be scared of taking on Tesco – and that this would be a failure of their duty. The alleged secret installation of plant in the first floor accountants’ office was particularly shocking, as I understand this would be a change of use without permission. I guess the decision not to take action must be based on the fact that Tesco now say they won’t breach the condition about delivering to the front of the site. How could the Council bring an injunction against a company to stop them doing something hypothetical when the same company has said they have no intention of doing it? This implies that action will be deferred until the first illegal delivery takes place. But, then again, plenty of illegal deliveries take place all around the City and the Council does nothing. In practical terms, it is quite obvious that Tesco will not be able to deliver via the back streets. I could give many examples of oversize vehicles becoming stuck in the one way system and/or damaging parked cars. Only yesterday my girlfriend witnessed a fight in the street after a lorry knocked the mirror off a car and tried to drive off without stopping. On one occasion a few years ago, one of my neighbours left a removal lorry in the street for several hours, and all vehicles the size of a van or larger could not get through, so had to reverse back around the one-way system. The only other point that I would add is that chair Cllr Blencowe conducted the meeting in a dreadful manner. He managed to antagonise the entire crowd of about 100 people by continually interrupting speakers and preventing them making their points. At one point he started accusing Ruth Dyermond of the No Mill Road Tesco Campaign of acting without the knowledge of the Group’s members and costing Council tax payers money by threatening to take action against the Council. I felt this was an overly personal (and irrelevant) point to be making, and totally outside his remit as Chair. It is also factually wrong, as it is clear from the Campaign’s website that they are raising money for exactly this purpose. At this point I stood up and made this point, as it was allowed to interrupt with points of order about the conduct of the meeting. Finally, let me add that these observations are all my own personal views, and do not represent any local groups with which I am involved. I think that once Tesco had withdrawn their threat to deliver from Mill Road in breach of the planning condition, it was inevitable that the Council would decide to take no action. The council would have to pay the costs of the action (and Tesco’s costs, since they would argue it was unnecessary) and would have nothing to show bar a promise to the Court, rather than just a promise to the Council. Sadly, I have to agree that it wouldn’t be a good use of public money. Although Tesco, the planning inspectors, the highway authority and numerous residents have said that delivering via the back streets in enormous wagons (which Tesco thus far refuse to forego) is dangerous and impractical, it doesn’t seem to be illegal. We have always known that Tesco have permission to open a small shop on that site. This they are now doing. They admit themselves that it will be “unique” amongst the Tesco Express chain (although the restrictions on the product range will presumably be much less now they have the spare shelf space that would have been taken up by alcohol). It is unfortunate that the NMRT campaign – and especially Ruth – has set itself to regard any opening as a failure and a defeat. In fact, it is the move to the next stage of the campaign, and must be seen as such. Tesco are obviously acting on the basis that inertia will wear down the opposition. In many places that formula has worked. If Mill Road is really different, then there is no reason why they should be right. I’m a bit surprised that David thinks that it’s particularly me that has a view about the issue. I suppose it might look that way because I’m the person speaking for the campaign on these kinds of matters at the moment. I can assure him that this is not the case – certainly not on the basis of emails that we’ve been getting and conversations I’ve had, or comments at the various meetings and events there have been recently. There’s a basic problem here, which is that Tesco acquired a site that was unsuitable for the type of intensive use that Express stores involve. This has been recognised in council planning decisions and last year’s public inquiry. In all instances, the dominant issue was the risk to highway safety, and that risk has not been addressed. One other point: Tesco have not actually said that they won’t deliver from Mill Road. They have told the council that it is their “intention” to service the site via the rear yard. That’s very different from a commitment to always do so. They have in principle agreed to sign a binding undertaking not to service from the street but have not yet actually signed it. I and others who spoke today remain sceptical about Tesco’s intentions in this regard. I’m a local resident. Has the undertaking not to deliver from the front now been signed by Tesco? If not, is the injunction against the Council ready to be served? I would have thought that without residents of Sedgwick Street and Catharine Street witnessing and publicising dangerous breeches of safety on a regular basis, it’s quite likely that the opening of the store will in fact become a fait accompli. Even so, given what we were told was the ‘methodical’ workings of the Council, and its dismissive attitude to local opinion, I don’t hold out much hope for an effective intervention. The safety and inconvenience of the public were really not obvious priorities, compared to the chairman’s notion of procedural correctness, and anxiety about costly action against a company that is prepared to impose its commercial will. As far as I can tell, there are no restrictions on the size of vehicles allowed to use any of the back streets, so it is perfectly legal for Tesco to embark on the dangerous practice of driving large lorries around these streets. I do not believe either the City or County Councils can stop them doing this. Tesco say they would “prefer not to” and I assume their intention is to create enough inconvenience to the residents of those streets to support a future application by Tesco to remove the planning condition that stops them delivering from Mill Road. I think it is rather unfair to suggest that it is councillors who are failing to make the “safety and inconvenience of the public” a priority. Let us remember that it is Tesco who are the ones who are insisting, against all reason, on opening their “inconvenience” store and refusing to scale down their delivery systems to a suitable level for the neighbourhood. Councillors may be motivated by caution with public money. Tesco, as we know, are motivated solely by greed. After the meeting council officers stated that a decision notice and/or press release would be published on the council’s website (the meeting’s chair supported this). I would expect to find such a notice either here with the agendas and minutes or here with the latest news, but cannot find it. I think this is very poor practice on the part of the council, and I am glad I didn’t have too much faith in their assurance and took down my own copy which I reproduced in the above article. Was a decision actually taken? A decision was made not to take any enforcement action immediately. Quite. I am not sure doing nothing counts as a “decision”. And I don’t imagine for one moment that officers don’t already have delegated powers to take enforcement action. That part of the “decision” was just for the audience. I have been told that while some air handling equipment is on the upper floors, the office space remains present and usable. Presumably the equipment is in the roof and walls, in which case there is presumably not a change of use for the first floor itself. A quick correction: I’m not, and never have been, co-ordinator of the No Mill Road Tesco Campaign; I’m the committee member who deals with planning. Not that it matters! Richard Normington stated that he had come into Cambridge for the day (joking that he’d have more chores to do at home as a consequence). I simply reported this. I now believe the context of his comment to relate to the fact that he, commendably, took time off work to spend the day in Cambridge at the meeting.